I finally completed a garment. And it fits! And I like it. At least I like it today. Who knows how I will feel about it tomorrow? According to the fashion police, a person of my stature should not use this large print fabric on her lower half as it will draw attention to her figure problem. But I LIKE it. Whose idea is it that I have a figure problem, anyway? If someone wants to pay the fines in advance before the fashion police arrive, I would appreciate it because I intend to wear this. I apologize for the bad photos. I seem to lose the “neatness” of my garment when I use the camera self timer and run to my photo taking position. I know this pattern is 1980-ish, but I don’t really like wearing shorts, slacks or skirts in the summer. So I decided these to make some perfectly fitting culottes. It took forever to figure out how to get them close to that. On a scare of 1-10, I would give them 8. Why? The waistband sits below the natural waistline. I discovered that one who is long waisted with a VERY short distance from the waist to a protruding derrier doesn’t do well with this type of style. The waistband sits on me like the picture on the envelope. I’m not used to waistbands being that low and although the waistband fits, I keep pulling it up. 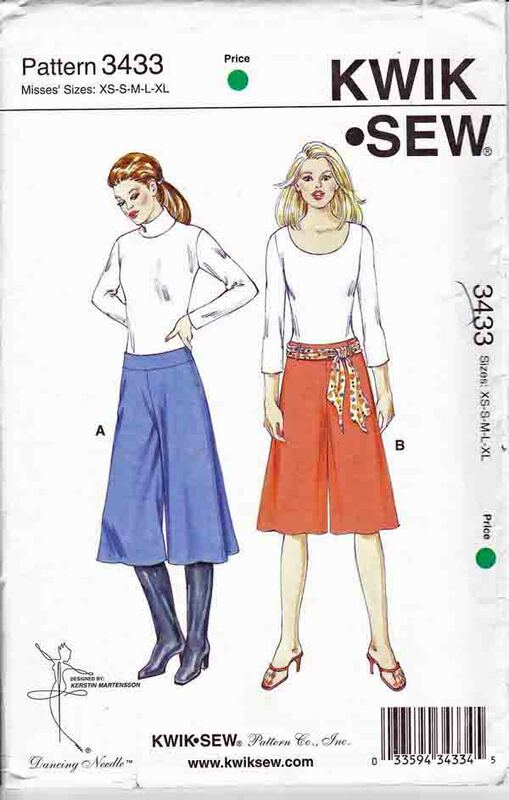 I didn’t like instructions for sewing the crotch and inserting the zipper so I followed directions from Vogue 2948. Dislike: There aren’t notches in the pattern. I shortened the crotch by length 1 inch and extended the back crotch by 1.5 inches. I had always thought I needed that rear wedge alteration to keep the back center from pulling down. I created a 3/4 inch wedge on the first muslin but removed it out on the second muslin. All I need to do is extend the back crotch length. I increased the front inner leg seams a total of 1/2 inch. I decreased the waistband by 1.5 inches the first time, 2.5 inches the second time, and 3.25 inches the third time (These are total measurements, not incremental increases.) I hate tight waistlines so I did it gradually. There is way too much to ease in the waistline. I went slowly with the waist adjustments because I didn’t know how the garment was supposed to hang on my hips. The garment was shortened 2.50 inches. This includes the 1″ crotch shortening. I plan to make again but am going to raise the waist, after all I have it fitted and everything memorized. Once I am satisfied with the fit again, I intend to use it as a guide for other patterns. I want to buy some really nice fabric for the final! Suggestions anyone? I don’t know if I would recommend it to others. There are so many similar patterns out there that can be used. I really like these and I plan to make them again. I’ve been so frustrated with my sewing lately that I took a break and organized my sewing room. 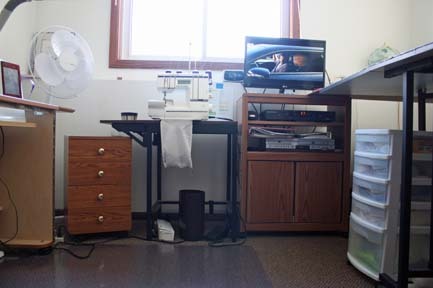 I took pictures when I was done and thought I would show off my sewing room. I have my cat, Cougar, to thank for my dedicated sewing room. In its previous life the room was a guest room. Don replaced the regular litter box in the laundry room with one of those newfangled Litter-Maid cat litter boxes. Cougar did not like the new litter box and Cougar decided to use the guest room to do his stuff. When I discovered it, I couldn’t get the smell out of the carpet. 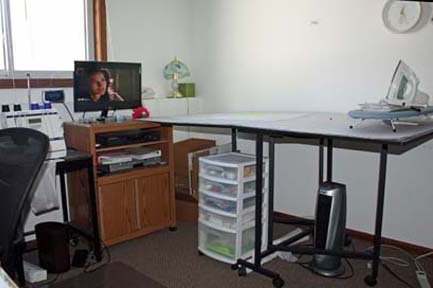 We gave the bedroom furniture to Don’s granddaughter, laid new carpeting in the room, and voila — I now have a sewing room! 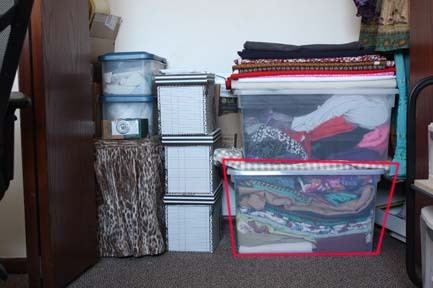 And what is a sewing room without a closet dedicated to a fabric stash? The fabric in the lower plastic bin, plus the checkered fabric on top, is part of the $10 Estate Sale Score I made last winter — and that included the bin! There had to have been a minimum of 125 yards of fabric in that plastic bin. I probably have used about 1/3 of fabrics making test garments. The fabric in and on the top bin was either given to me or I purchased. On December 17, 2013 I posted regarding Perfectionism. I have really thought about that post a lot in the last couple months. This post is a follow up to that. I still am stuck on wanting everything I sew to be perfect, but am thinking maybe I shouldn’t be so fussy. I am a great fan of PatternReview.com. 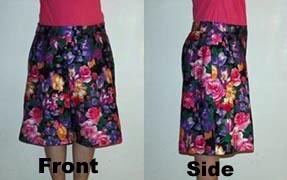 Many people write fantastic reviews for the pattern they used to make beautiful garments. They also model what they made. Most of the reviewers are pleased of what they made and how it looks on them. As well as admiring the fantastic talent and incredibly beautiful garments, I always look to see how the garment fits. On the garments that are modeled I often see indications of fitting issues that I seem to have. Yet, the model Is comfortable with how it looks on her/him. I am not sure I could wear a garment had those fitting issues. But then, am I being too fussy? 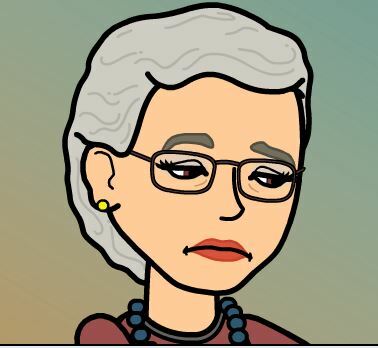 Someone reviewed a pattern and posted a photo of herself wearing a garment she made. The garment, in my opinion, was too big in various places, and didn’t fit correctly in other places. Yet, she was very was happy with the garment she had made. I don’t think I would be comfortable wearing something like that. I recently visited a website where someone had made jeans. I wouldn’t even buy jeans that fit like the model’s, let alone make them. Yet the person is happy with how they look and fit. I often notice on the pattern envelopes from the “Big Four” companies that the models wearing the garments have fitting issues that should have been corrected. I don’t like when the fabric pulls horizontally or vertically in places it shouldn’t. I don’t like v-necks that don’t lie flat. I don’t like shoulder seams that are not in the correct place. I don’t like drag lines, “smiles” or frowns” on pants. So I spend countless hours altering a pattern, creating a test garment, don’t like the way it fits, take it apart, alter it again, sew it back together again, and repeat the process. Often, I get frustrated and sometimes wind up with nothing. I’ve been sewing on a test pair of culottes. I have taken them apart and sewed them back together so many times I have lost count. Tomorrow I will finish the waistband and hem them. I must say except for a few things I will change on the next pair I make, that these do fit wonderfully. But it took forever to get them to fit this way. Thank goodness I wrote down what I changed and the measurement of the change. I would be nice to have someone help me with fitting, but because I don’t, I have to use what I call the “guess and alter” method. Perhaps I need to be less critical of myself and enjoy what I make. Am I being too hard on myself? Should I accept that I am going to sew and wear garments that, in my opinion, do not fit correctly? The only problem I have with that is that if I am going to sew something that looks like the way RTW fits me, why sew at all? I have been meaning to post this photo for a couple of weeks now. This is the view from my sewing room on February 29, 2014. 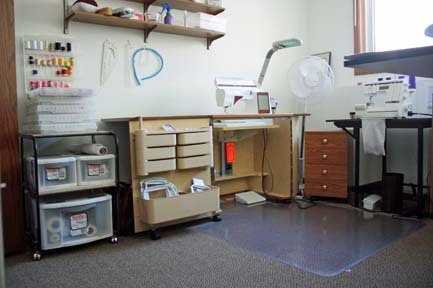 My sewing room is located in the lower level of our split level. The window faces east. The angle of the photo is funny because the snow is not up to our garage roof. However, this is what I see when I look out the window! 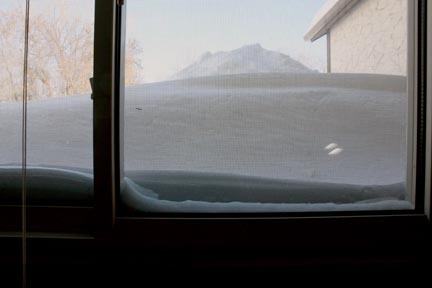 The snow looks like it is on the inside bottom of the window. It is definitely outside.